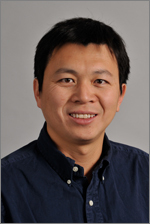 Lianbo Yu is a research assistant professor at the Center for Biostatistics in the Department of Biomedical Informatics at The Ohio State University. Dr. Yu earned both his Ph.D. and M.S. degree in Statistics at Purdue University, where his research focuses on developing advanced statistical methods for high-throughput biomedical data. He started his career at the Center for Biostatistics as a biostatistician, and has worked on collaborative research on various human diseases (cancer, HIV, etc.).Dr. Yu’s research focus is to answer genomic based biological questions by utilizing high-throughput genomic data. He is currently interested in (1) variance smoothing for testing differential expression in NGS data, (2) sample size calculation for NGS data, (3) data integration of multiple genotypes and multiple platforms, (4) prediction models with biomarkers. Biomedical experimental design, biomedical data modeling, disease diagnosis and prognosis using biomarkers. experimental design, biomedical data modeling, disease diagnosis and prognosis using biomarkers. 1. Hunter MP, Ismail N, Zhang X, Aguda BD, Lee EJ,Yu L, Xiao T, Schafer J, Lee ML, Schmittgen TD, Nana-Sinkam SP, Jarjoura D, Marsh CB. Detection of microRNA expression in human peripheral blood microvesicles. PLoS ONE , 2008; 3(11):e3694. 2. Crawford M, Brawner E, Batte K,Yu L, Hunter MG, Otterson GA, Nuovo G, Marsh CB, Nana-Sinkam S P. MicroRNA-126 inhibits invasion in non-small cell lung carcinoma cell lines. Biochemical And Biophysical Research Communications , 2008; 373:607-612. 3. Qian S, Zhong X,Yu L, Ding B, de Haan P, Boris-Lawrie K. HIV-1 Tat RNA silencing suppressor activity is conserved across kingdoms and counteracts translational repression of HIV-1. Proceedings of the National Academy of Sciences USA , 2009; 106(2):605-610.
ector cells.Clinical Cancer Research, 2007; 13(17):5010-5019. 5. Jacob A, Robinson LL Jr, Bortman JS,Yu L, Dodson EE, Welling DB. Nerve of origin,tumor size, hearing preservation, and facial nerve outcomes in 359 vestibular schwannoma resections at a tertiary care academic center.Laryngoscope. 2007;117(12):2087-2092. 6. Jacob A, Bortman JS, Robinson LL Jr,Yu L, Dodson EE, Welling DB. Does packing the eustachian tube impact cerebrospinal fluid rhinorrhea rates in translabyrinthine vestibular schwannoma resections?Otology and Neurotology, 2007; 28(7):934-938. 8. Li M, Kesic M, Yin H,Yu L, Green PL. Kinetic analysis of human T-cell leukemia virus type 1 gene expression in cell culture and infected animals. Journal Virology, 2009; 83(8):3788-3797. 9. Bolinger C, Sharma A, Singh D,Yu L, Boris-Lawrie K. RNA helicase A modulates HIV-1 translation and infectivity. Nucleic Acids Research, 2010; 38:1686-1696. 10. Hayenes II R, Ware E, Premanandan C, Zimmerman B,Yu L, Phipps AJ and Lairmore MD. Cyclosporine-induced immune suppression alters establishment of HTLV-1 infection in a rabbit model. Blood, 2010; 115(4):815-823. 11. Haynes II R, Zimmerman B, Millward L, Ware E, Premanandan C,Yu L, Phipps AJ, and Lairmore MD. Early Spatial and Temporal Events of Human T-lymphotropic virus type 1.Spread Following Blood Borne Transmission in a Rabbit Model of Infection. Journal of Virology, 2010; 84(10):5124-5130. 12. Dworkin AM, Tober KL, Duncan FJ,Yu L, VanBuskirk AM, Oberyszyn TM, Toland AE. Chromosomal aberrations in UVB-induced tumors of immunosuppressed mice. Genes Chromosomes and Cancer, 2009; 48(6):490-501. 14. Dmitrieva N,Yu L, Viapiano M, Cripe T, Chiocca EA, Glorioso J, Kaur B. Choin- droitinase ABC I enhances intra-tumor distribution and anti-tumor ecacy of oncolytic virus. Proceedings of the National Academy of Sciences USA, 2010.